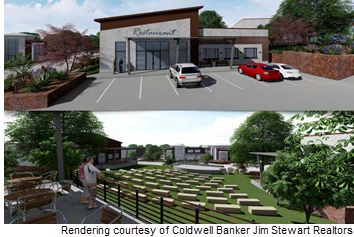 ​​ WOODWAY – A Dallas developer has proposed The Outlook at Bosque Ridge to bring retail, restaurants, an amphitheater and office space at US Hwy. 84 and Ritchie Rd. About 11 acres have been acquired next to the Midway Independent School District Administration Building for the development. Visions include an 80,000-sf planned development spread over five or six buildings and dotted with fountains, holding ponds, patios, a playground and an entertainment venue. “The total project, not including tenant build-out, will carry a price of about $15 million,” developer Marshall Stewman said. Stewman said he hopes to complete site work and have building shells in place by late spring 2019.